Come to the Big Lynn Lodge where the air is always fresh and cool, the views are spectacular, and the food is simply delicious. Our rates, including dinner and breakfast for two people, range from $105.00 to $160.00. Each additional person is $27 and includes dinner and breakfast. Ask about our discounts. Meeting room space is available for weddings, family reunions and other special events. Catering is offered as well. 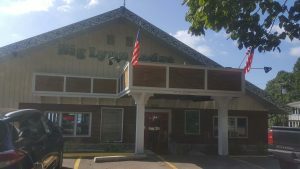 Why not make some memories at the Big Lynn Lodge? From the last weekend in March through October 31st our restaurant is open to the public, featuring our delicious home-cooked meals which include fresh-baked bread and dessert. Breakfast is served from 7:30 until 9:00am and dinner is served from 6:00 to 7:30pm. The cost for those not staying in our lodge is just $6.50 for breakfast and $15.00 for dinner. (Meals are free for those who stay in our lodge). We hope to see you soon in Little Switzerland, NC, The Beauty Spot of the Blue Ridge!